Today on the One Word, Go! Show, Breanne sets the show ablaze as the Crimson Mistress and Mat tricks the clocks as Time Sham. Ironically, Fish is the cool one as the Flying Fish, while Dan is the one who flies away as Frost Lass. Tune in next week at the same One Word, Go! Show time, on the same One Word, Go! Show channel. We did a follow-up to this episode two years after this one was posted. Check out Episode 84: “Superpowers 2: The Shocking Arrival of the Elec-terrifying Count Volt”! Today on the One Word, Go! Show, Dan offends Jamaican people, Fish plays the banjo in Pizza Consumption¿, Breanne counts with pie, and Mat goes to Chuck E. Cheese’s! 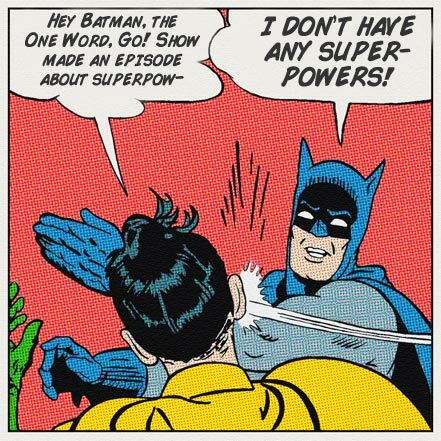 On the very first episode of the One Word, Go! Show, we discuss Canadian junk food, get creeped out by Willy Wonka, reminisce over past teachers, and learn about the infamous Mark Hansen.